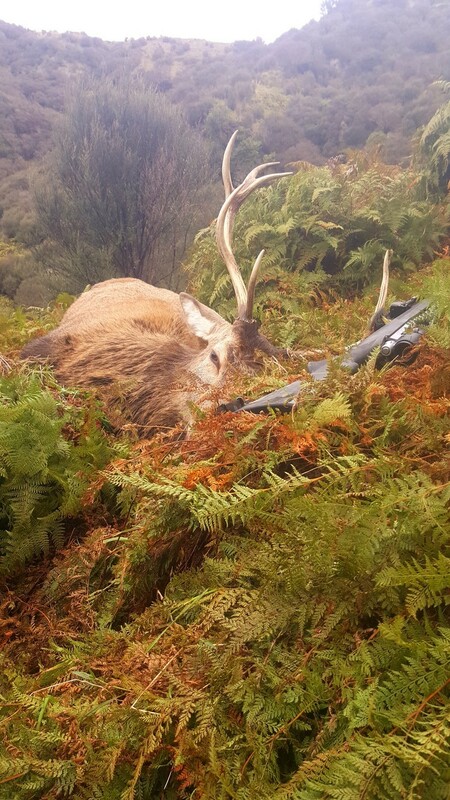 After lots of goat control with the Creedmoor, and a failed pig hunt (pig broke and jumped down a ravine), I climbed up high with my .243 Win in search of a red stag, something worth taking not for a trophy but the opposite, to remove him from the gene pool, but he had to be in ok condition for the meat. There's been a few manky heads around this last roar, and I had a pretty good idea roughly where they'd be. With the north-westerly in my face, up I went, expecting to find deer lying up on an easterly face out of the breeze. Watched a large mob of hinds with a couple of really decent stags, not really what a was after. Eventually, there it was, close to the very top and me getting a bit tired now after the 4am start on a failed pig hunt, 13km in the morning and now another 8km or so in the afternoon. Two red stags in the fern and scrub, steeply downhill on the east face of a N-S spur at 218m with HCD applied. One was the distinctly lopsided 9 pointer I’d seen before, at least a year older than his mate who was just out of spiker stage. I selected the former, lying prone with the rifle pressing the bottom of the fence wire flat on the ground. 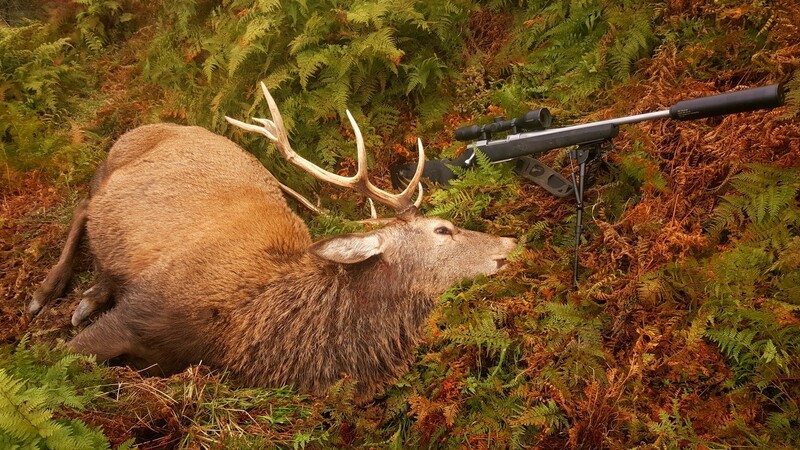 A 100gr ProHunter into the base of the skull and he lay down conveniently right there. The wind and my elevation caused the other stag to startle but not bolt, he was looking in 180° the wrong direction for the threat. I had a helluva slog down the ~45° muddy spur it being so wet, but as I approached I hadn’t heard him bolt so got the phone out just in case. Quietly quietly softly softly, I was pretty shagged by the time I got in close. Pretty stoked with that, a good up close and personal encounter. The fenceline shooting position is visible in this photo, nice and high above the animal just as I like it. So a pretty productive trip, there is one more thing to write up (of a slightly different nature). Right now I need to spend several hours cleaning my gear. And me. And SOME BEER. Tahr, veitnamcam, Brian and 20 others like this. Why can't I get the YouTube to show as a thumbnail? And why won't it ever let me edit it afterwards?! That was an epic day alright, you will be glad it's over and having a beer and a freezer full of meat. really neat video....funny as heck when he comes to check out his mate.... thanks for shareing it. veitnamcam, turtle and BeeMan like this. Nice video, watched it through. Some nice meat for the freezer to top it off. Enjoyed reading your type up also. Looking forward to more! Neat encounter. Loooks like very nice country. Sorry I don't know why but the image hosting site unilaterally decided to delete the pictures of the stag. jakewire, rusl, chainsaw and 4 others like this.